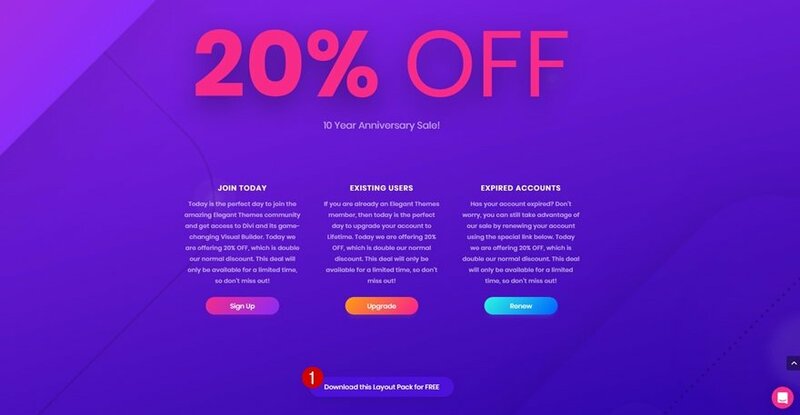 The new Timeline Layout can be downloaded for free but ONLY during Elegant Themes’ 10 Year Anniversary Sale which ENDS TODAY. It’s a slick design that’ll help you showcase the timeline of your company or any other type of timeline you want to share with your visitors. On top of the free layout, we’re going to share an interesting tutorial that’ll help your visitors navigate through this page using dot navigation. Dot navigation is a nice extra to have on your page. Especially if you have a pretty long page you want visitors to easily navigate through. And in this tutorial, we’re going to help you take it even one step further. Instead of having just dots on the right side, you’ll be able to give all of your relevant sections a label that’ll match with the section it represents. That way, visitors can navigate to a specific year whenever they’re on this page. Before we dive into the tutorial, let’s take a look at the exact design we’re going to create. We’re using Elegant Themes’ free 10 Anniversary Timeline Layout which you can download by going to our 10 Year Journey Page. If you’re not an Elegant Themes member yet, or if you want to upgrade/renew your account, now is the time! We’re offering a discount of 20% which is double the amount of discount you can normally get! While you’re on the 10 Year Journey Page, you’ll also be able to download the free timeline layout which was used to create this beautiful page by clicking on the download button. After downloading the free Timeline Layout, you’ll need to upload it to your Divi Library. To do that, go to your WordPress website > Divi > Divi Library and upload the JSON file within your zipped folder. 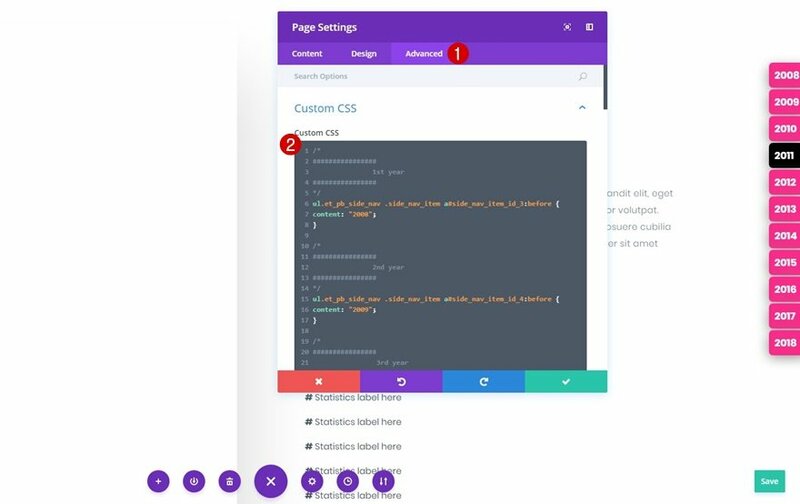 Now that you’ve added the layout to your Divi Library, it’s time to create a new page. After adding a title, make sure you enable Dot Navigation within Divi’s Page settings. We can now switch over to the Visual Builder right away. 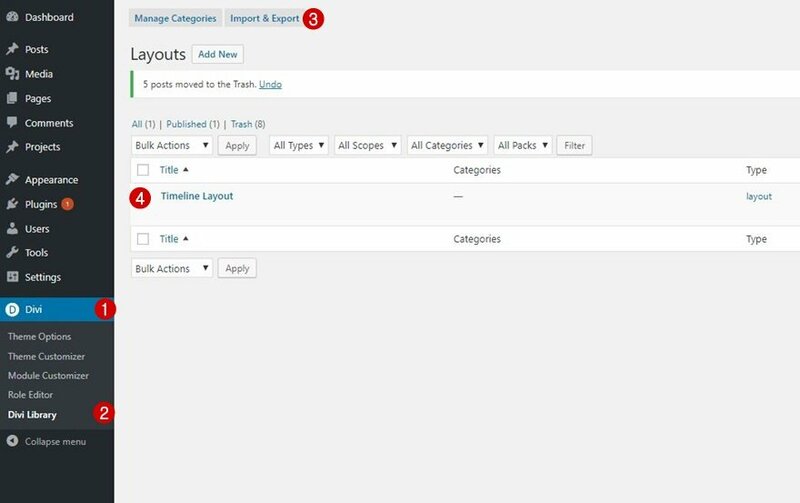 Upload the Timeline Layout by clicking on the plus icon and selecting the layout within the Your Saved Layouts tab. For the sake of knowing where to navigate to on your page, we’re going to give each one of our timeline items a year. 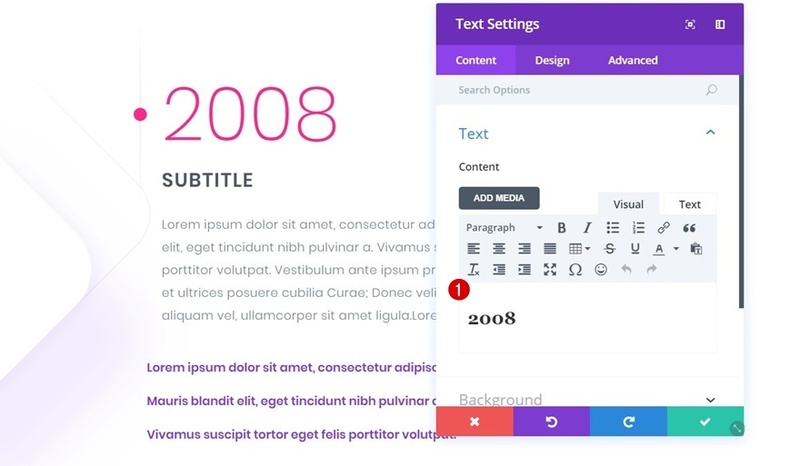 We’re simply using Elegant Themes’ journey from 2008 to 2018. Go ahead and add these numbers in chronological order. After we’re done adding new sections, you can change these Text Modules to whichever text you want to use instead. The first additional section we’ll need to create is one for the introduction. That way, the first timeline item will have its own section. Timeline items 2010 & 2011 are by default located in the same section. Create a separate section for 2011 and place the row in it. Going to the Advanced tab and placing your CSS code in the Custom CSS box. We hope that you’ve enjoyed this tutorial. Make sure you check out our 10th anniversary’s limited discount of 20%! This discount counts for new members, existing users who want to upgrade or renew and expired users! If you have any questions or suggestions, make sure you leave a comment in the comment section below! Nice, Will save this article as an archive. Can be used for nav items other than years. This can, indeed, be used with other labels as well! Nice, though I feel it should be build into Divi to give labels to the dot navigation. That could be by using the section ID, the admin label or an entirely new field for sections. 10000000000% correct imo. Although this idea works it is not a perfect solution. Awesome! I personally did it for my website with JQuery but this wasn’t as good as yours. Thank you again for this awesome tutoriel. I’ve used a different approach for the Divi DotNav plugin for adding labels to dots and showing/hiding dots of specific sections. It uses section IDs as dot labels and hides dots using a CSS class that needs to be assigned to those sections, dots of which you want to hide. But, of course, that is not a pure CSS solution. You’re welcome, Ivan! That sounds like a great approach. Does it work 100% in responsive mode? Thanks for sharing this, good stuff! Wonderful, Just what I needed! I implemented it directly on my site. As I have a set of colors which I try to roll out throughout my site, I am lookingto change the coloring of the Dot next to the Year. I can’t find the Dot registered. Can you help me with this. Added the idea to a client’s website, they are very happy, as we are. Boy, I really love this! As a newbie I misunderstood some of the directions, and then to top it off, I left out a comma in the CSS. But finally, I got it to work. I have several projects I am going to use it for. Thanks for posting this! this may seem like an ignorant question, forgive me, but how do I make the navigation bar longer to fit more type? I love this, but how can I make the text for the swapped dot navigation dynamic? Meaning if I create a section, assign it a name, and have that name be used as the text anchor link?